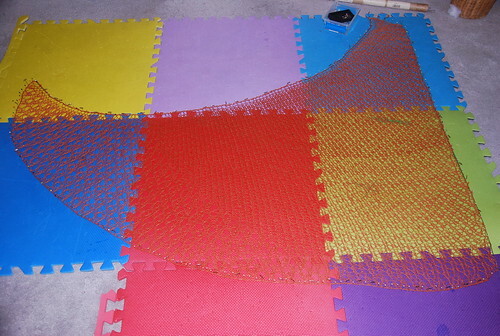 Living a little and crafting a lot – knits, spins and even weaving! The past month took me home for a sad occasion with family. It has meant working harder to get ready for the holidays ahead but I came back deeply grounded. On the flight south, I took out my new Ampersand sock-in-progress… only to find out that my seat-mate was also a knitter! 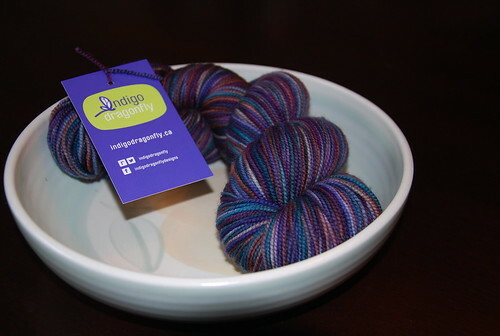 She had holiday knits on the go, and I got down to the foot with this lovely Indigodragonfly merino yarn as we knit along with each other. A better blogger would have the actual sock project to share, I know. This is the trouble with major disruptions & terrible seasonal lighting around here – not for everyone but if you are me the photography it suffers. Catching us Up (a bit)! You were missed, as I was propelled forward. This is only the tip of what’s been happening while I was away from posting. We can call the wheels at home a herd now. Only a couple days before our sad news was delivered, I had another trip to visit Alvin & Barbara Anne Ramer. Alvin repaired my antique William McDonald wheel while I cough fell in love with the smaller wheel in the foreground cough. 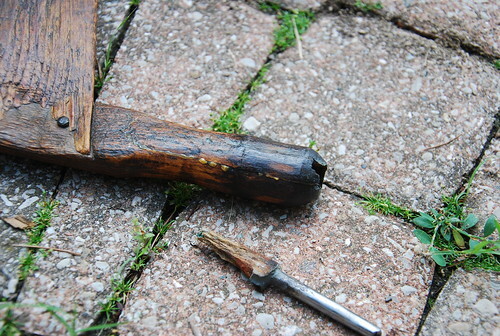 The separation of this metal pin and an old fix to her treadle bar needed attention. Alvin fixed this main problem, and he also made other adjustments to the wheel. It was awesome to see him in good health & at his wheel-smith work. 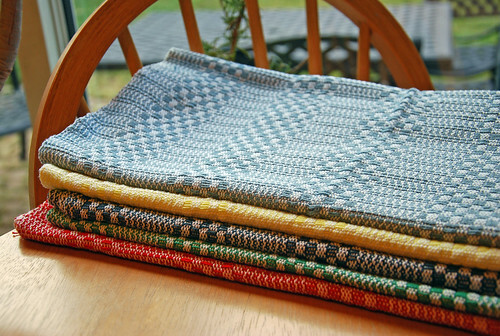 Barbara Anne was so gracious as well, and I loved speaking more with her about spinning, weaving and her plans. 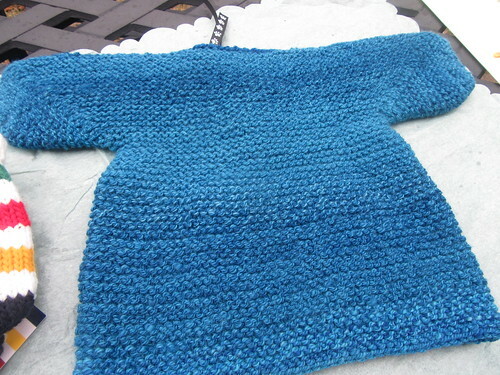 The first spin is 646 yards (127g) of BFL wool/silk. 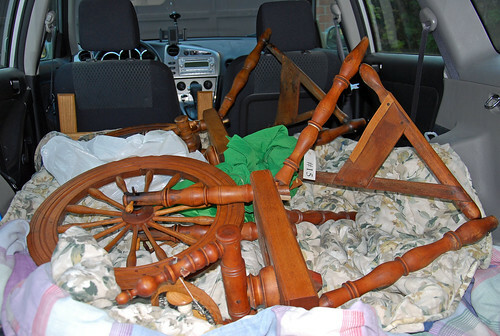 It was all plied on my Watson Martha wheel in double drive. 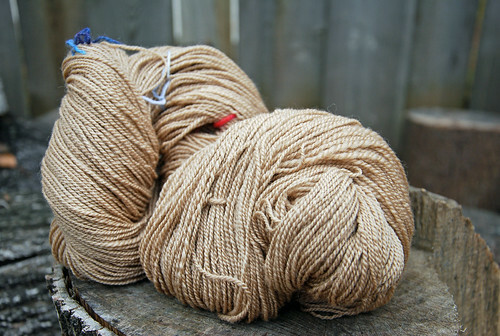 Last Thursday, I used this yarn for a great dye experiment with Madder root. The mordant is alum @ 8% and cream of tartar @ 7%. I brought the 100g of ground Madder with 1 tbsp of baking soda up to a simmer, and cooled overnight. 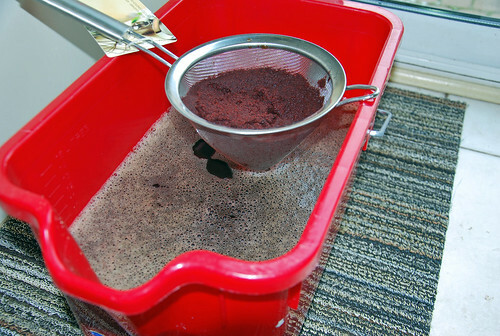 Straining madder root from dye liquor! Further tweaking happened in the morning after straining, and I mordanted handspun Dorset (horned) wool yarn for the legendary exhaust baths. This operation was surprisingly fragrant! 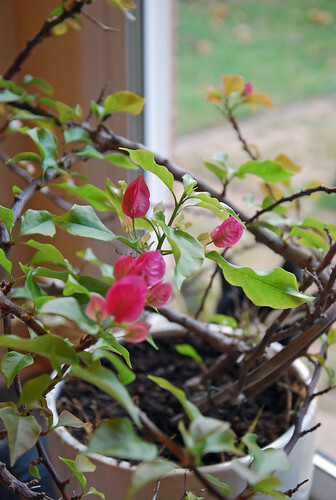 The madder has a nutty, smoky aroma. After rinsing & drying, I have rich oranges – and the exhaust material/bath in reserve! 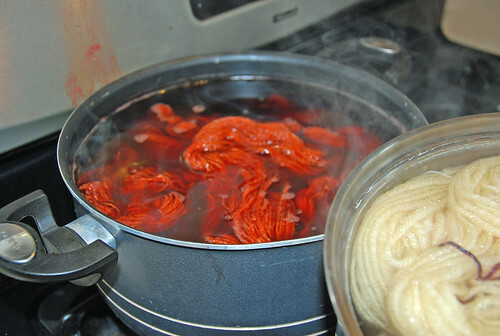 Although I strained & rinsed thoroughly small specks of the ground dyestuff are scattering from the skeins. It’s no big deal at all but is a side-effect! 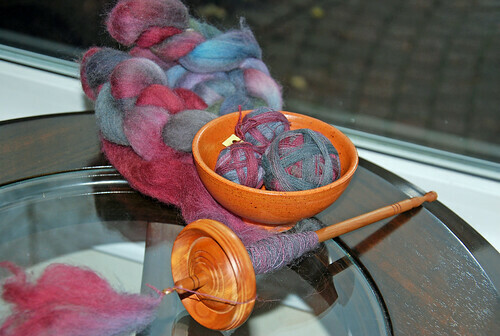 The McDonald antique wheel was also a joy for spinning my Falkland top that is dyed with black walnut. The 5.9 oz gave me 593 yards of 2-ply. This time I changed ratios on the Watson Martha but still plied in double drive. All have been in rotation since I recovered from the time away. These are just quick out-takes (in no particular order) while I keep gaining on deadlines. 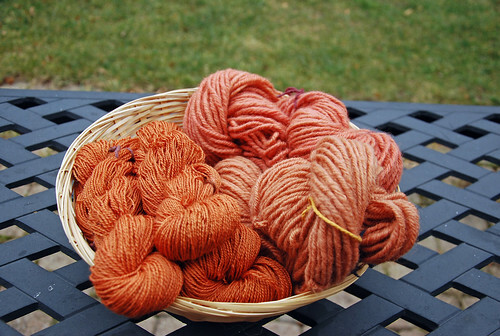 The dyed-by Sheepspot spinning project is down to the last 44g of Polwarth wool. 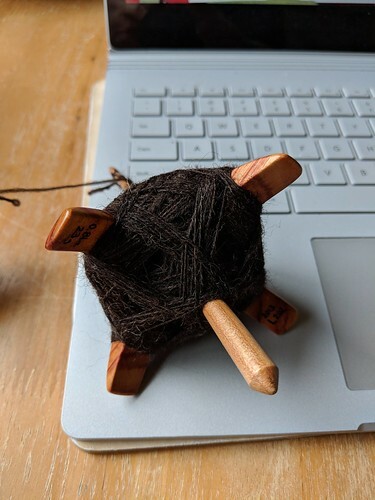 Having the cedar Tabachek drop spindle in regular use again has made me so happy. 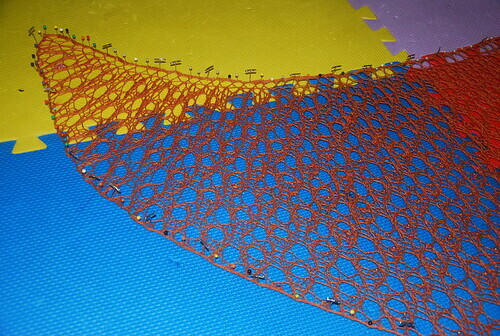 My plan is to chain-ply this yarn when it is all spun up. Oceanside Ent Batts for a Moosie WIN! 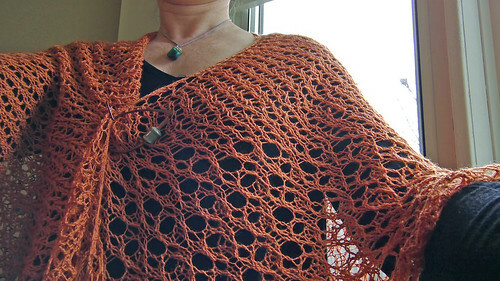 These batts by Naomi at Enting Fibercraft are amazing. 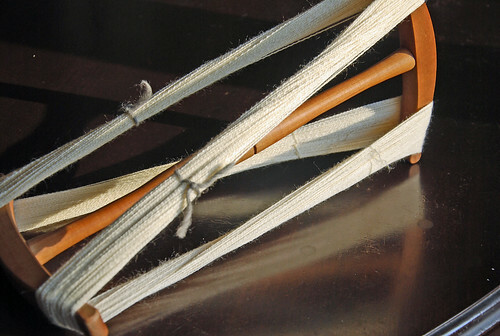 Four breeds of wool are blended with Tussah silk & Bamboo rayon. 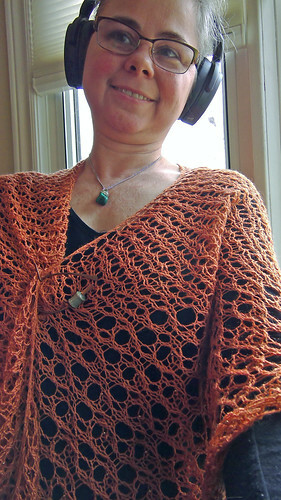 The colour is so deep, and the blend is just fabulous on my Moosie spindle. Learning curve & humble pie to mix metaphors! These towels stretched me so much. The red one is unwashed. A mistake that glared at my friend Diane in the top towel got corrected thanks to her kind pointing-out. 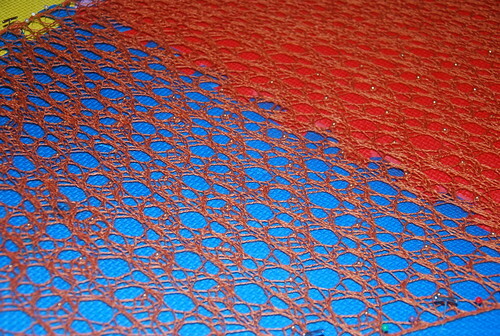 They need pressing, hemming and documenting but they certainly have happened! 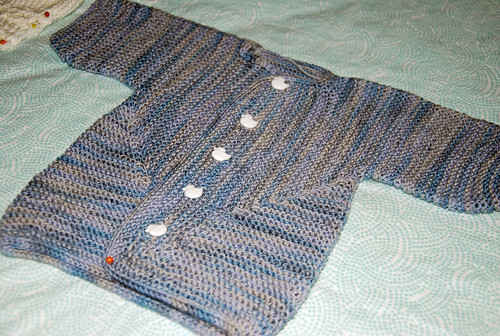 A lace-edged hat, and booties went with this Baby Surprise Jacket for my cousin. 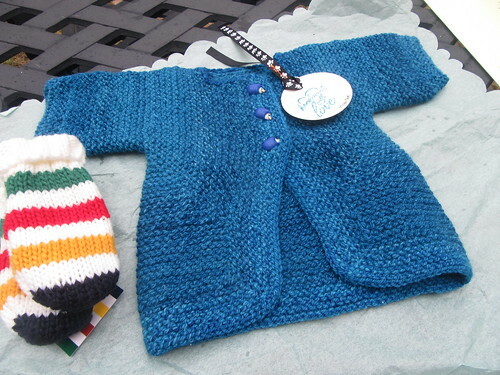 Her shower was this past Sunday, and we can’t wait to see her baby outfitted in the knits! 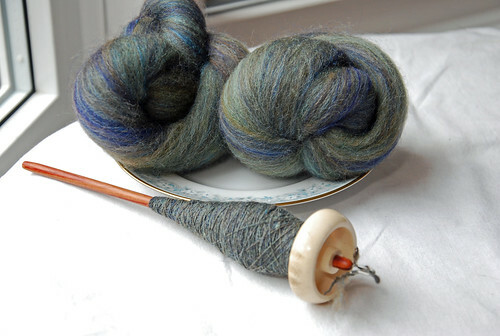 Categories: Getting the knack, Natural Dyes, Spinning, Stash in; Stash out, Weaving | Tags: Antique spinning wheel, Baby gift, drop spindle, Equipment, Flora, handspun yarn, handweaving, Madder, Nova Scotia spinning wheel, socializing, Sock, Spinning | Permalink.